It has long been a truism that women are underrepresented in the world of Western science. This book may fix that problem. Young girls who accompany Fizz on her journey will quickly discover how good it feels to satisfy their curiosity about how the universe works. Men and women of all ages who enjoy learning outside of school will also be enthralled with these adventures in physics. The beginning point: An Eco-commune in Iceland in the future (2110) which eschews science and technology as leading to prying, meddling, war, and destruction. Like other technophobic groups, they allow young members a trip to the Outside when they come of age, to decide for themselves how they wish to live. 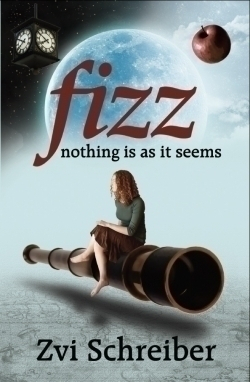 Despite considerable opposition, Fizz makes the choice to answer her questions about the world she lives in. What the Ecocommunity doesn’t know is that Fizz’s dad, who left before she was born, has invented a time machine. Fizz will spend her PCC (Personal Choice Clause) dining with Aristotle, throwing apples at Newton beside the river Cam, and discussing the mind-bending theory of Schrodinger’s Cat with Einstein himself. But all along several questions plague her: Would she rather live in her mom’s world or her dad’s? What really happened between her parents? Is it okay to label technology “evil” while accepting the benefits of advanced medicine? The personalities of the real-life physicists are well-drawn: From the arrogant Aristotle (who thinks women are less human) to kindly old Galileo to the hostile and suspicious Newton, etc. Challenges that each scientist faced are presented boldly—opposition from the Church in the case of Copernicus, world wars that prevented Niels Bohr and Albert Einstein from communicating with other scientists, gender bias in the case of Marie Curie. Somehow, physics moved on—and young Fizz asks all the right questions. Will she ever get home again? And if she does, how will she have changed? Zvi Schreiber’s writing is clear and the plot zooms along. A mention of Islamic science, which developed certain modern scientific methods earlier than Greece did, or early advances in China would have made the book more comprehensive, but for a history of Western science (full of old dead white guys as it is) the book covers a staggering number of European countries plus America and many different time periods. Not since Sophie’s World, to which this novel bears important similarities, has there been a book to do for the scientific world what the former did for philosophy—inform, intrigue, and entertain. And in Fizz‘s case, a book that may need to be set down for a moment just to digest the ideas. Fortunately, served up like tapas as they are, it’s usually a pleasant experience. Even Fizz has some hostility toward the general theory of relativity when first introduced to it, but that’s because if you’re not a genius, it’s just so darned hard to comprehend. Still, it’s the trying—and the discussions—that are fun. A lot of fun.